The Paitec ES2000 is the most friendly desktop pressure sealer available, with exclusive Angled Seal technology, giving it perfect, lightweight sealing quality with each form fed, and is surprisingly easy to maintain. Perfect for Paychecks, Invoices and Statements, Tax Forms, Utility Bills, Expiration Notices, Promotional Coupons, Invitations and much more. The Paitec ES2000 has an extremely low noise level of less than 46db with impressive folding quality, all in a compact and dynamic design. 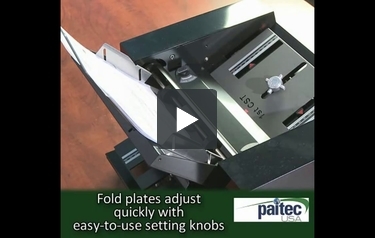 The Paitec is a workhorse, able to process 2000 forms per hour, with an input tray able hold up to 150 forms and an optional batch counter. Contact MyBinding.com today to speak with a representative about how this innovative machine can improve your form workflow and increase your bottom line. Form Sizes: Depth - Up to 14" / Width - Up to 9-1/4"
Hi there! We would love to give you a quote for these machines. We did want to mention these machines are only available in a 115V . You should receive a quote shortly.